There are nowadays professors of philosophy, but not philosophers. Yet it is admirable to profess because it was once admirable to life. To be a philosopher is not merely to have subtle thoughts, nor even to found a school, but so to love wisdom as to live according to its dictates, a life of simplicity, independence, magnanimity, and trust. It is to solve some of the problems of life, not only theoretically, but practically. Good evening! All I had time to do this evening was block in the Dodge truck, and then my light was gone. I really don’t wish to paint under house lights at night, I have become so attached to the natural light coming in through my studio windows. Alas, I’m having to re-adjust the hours of the day now, to allow space for doing my job. Today was more about living an artful life than making a piece of art. I’m not finding the adjustment easy, but will have to find a way. The first day of school went very, very well. Two enormous classes, and one moderate-sized one. My two A. P. Art History classes show great promise, and I regret waiting two days before seeing them again. Tomorrow will be Philosophy and Sophomore English. The latter course I have never taught before, so I cannot say I am looking forward to that with enthusiasm. But, we’ll see . . . There is plenty of work to be done still to prep for tomorrow’s courses, so I’ll be signing off early this time. 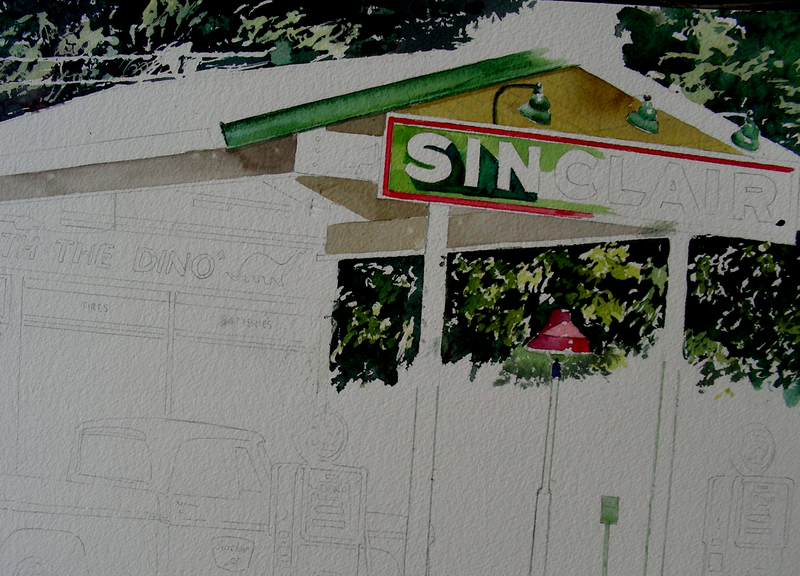 I really hope I can hit this watercolor a little harder tomorrow. What I feel, however, is that I will need some days to adjust to this full-blown school schedule. One way or another, I will return to the blog with vigor, trust me. I love communicating with you. When you see the spark of ambition, water it. Fall term begins tomorrow at James Martin High School, Arlington, Texas, my professional home for twenty-five years now. My A. P. and Regular Art History classes are ready now, and I did manage to get in some quality watercolor time this afternoon. 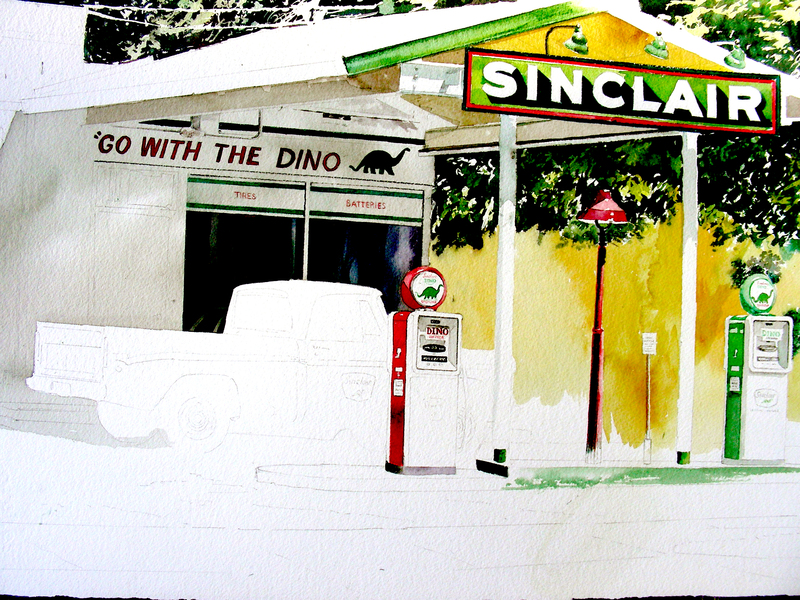 Today I found myself drawing, erasing and re-drawing quite a number of details related to the gas pumps, signage and posts as well as the concrete island that anchors them. I really enjoy drawing and revising in the midst of watercolor, and I’m finding more and more ways to use graphite and colored pencil along with my brushes and Winsor & Newton pigments. Today was no exception. 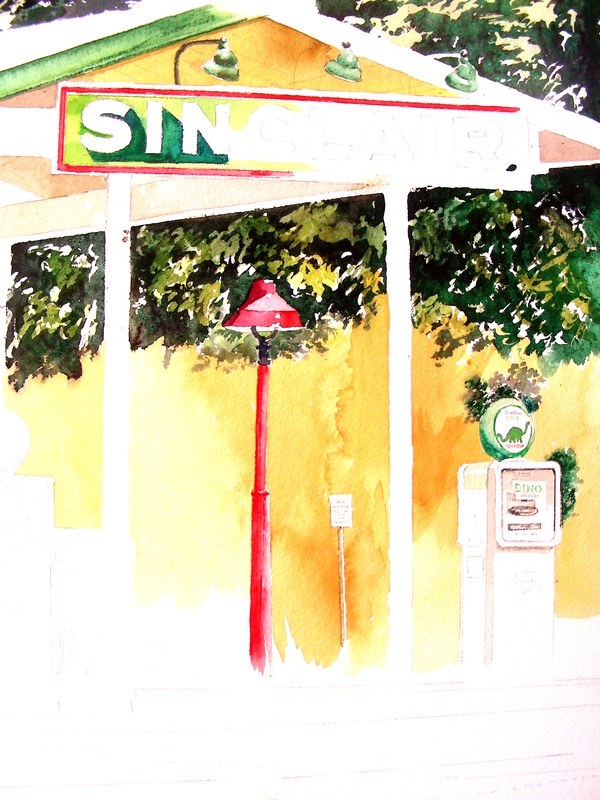 Finally, I managed to paint the red gas pump to the left, and finished the green one on the right. I’m ready now to begin work on the truck, and am still unsure as to how to get its color right. It is a pale sea green, quite unlike the Sinclair green that already has given me plenty of fits! I’ll take my time on that. I notice now that I have quite a bit of drawing left on the truck details as well, and plenty of decisions to make as to the rendering of the reflections on its windows. I indeed wish I could put off school one more day. I’m not sure if I’ll be able to paint tomorrow. Tuesday (lucky me) I’ll begin teaching yet another subject never taught before (they sprung that on me last year too–fun). It’s possible that I’ll still be making decisions tomorrow afternoon concerning the Tuesday load. Education, I fear, is learning to see one thing by going blind to another. The statement above by Aldo Leopold could be taken in a number of ways. Having completed a week of Inservice before beginning the new year at my high school, I heard a number of pontificators telling the audience what was wrong with public education and how to take steps to remedy it. As in former years, we were covered with enough statistics to make our heads swim, along with bullet lists of guidelines designed to correct the shortcomings perceived from the statistics. From my perspective, every year a new educational flavor is passed down from officials on state and district levels, accompanied with new books, written by the latest education gurus. My reason for posting the Leopold quote is this: education is a lifestyle, not an institution, and learning is always more comprehensive than the lesson plans and statistics that are printed up and passed out each year. I awoke at 7:50 this Saturday morning, because my mind was overflowing with ideas spawned from what I ingested the past week, from art history, philosophy, literature, religion and music. My reading, as always, has been diverse, as I have pored over poetry, essays, private journals, fiction novels, short stories, histories and biographies. I have also been soaking myself in watercolor theories found in books, DVDs, Youtube and my own experiments in the studio. This past week, for me has been a stimulating education, and virtually none of it rose from my Inservice meetings. None of the issues that excite me right now were revealed by a speech, lecture, a stack of handouts or curriculum guides. I love learning, I am starving to know more, I am obsessed with exploration, and unfortunately, I feel that I have to work overtime to safeguard that enthusiasm, while the machinery of public education continually finds ways to squelch it. If it were not for the affirming, supportive administration and faculty within my own building, I would probably have walked away from this profession long ago. Right now, I am as excited as I have ever been to meet my new students on Monday, and that excitement took root Thursday and Friday, when finally I was allowed time and space for privacy in my classroom, to set up my environment, read, reflect, and write up my strategic plans for the opening week of classes. Rising early this morning, I entered my studio when the northen lights were clean and refreshing, and spent a long while poring over this watercolor before deciding what to do next. 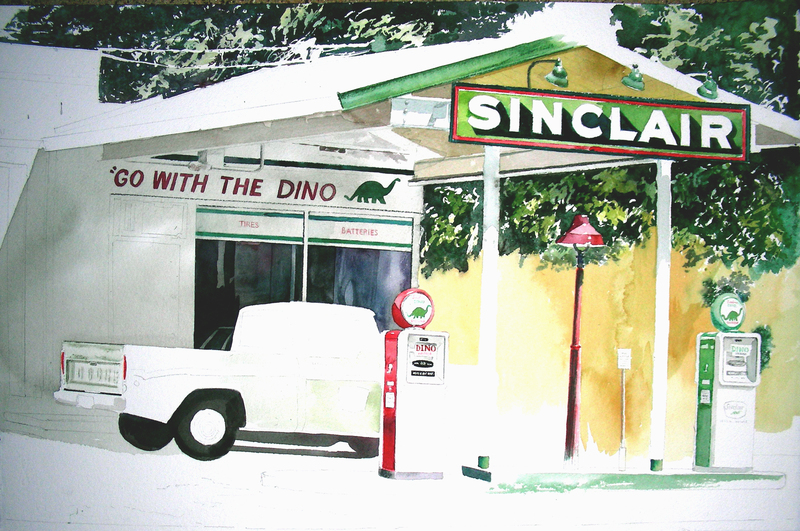 I found myself in a “detail” mood, so I finished the Sinclair sign, painted the slogan under the roof and added the “Dino”, shaded the red post of the lamp, then went to work on the details under the awning, where shadows play among the I-beams and framework. I also re-worked the reflections on the windows of the station. Lettering is still my Achilles’ tendon, particularly Gothic lettering. I didn’t fret much over the white Gothic “Sinclair” letters, knowing that a good flat brush would allow me to paint around the letters, leaving the white paper to stand alone. But the red “Go with the Dino” lettering had me worried. Since it was in deep shadow, I mixed Winsor Green with the Alizarin Crimson, hoping it would pass for “shadow red.” I first outlined all the letters, continually sharpening a Tuscan Red Prismacolor Pencil. Then I wet the insides ofthe letters and floated the Alizarin Crimson mixed with Winsor Green, letting the colors run to the waxy edge of the Prismacolor outline. Maybe one day I’ll solve my lettering anxieties. I certainly haven’t yet paid my 10,000 hours’ dues in that discipline. Thanks for reading. I hope to return to this painting tomorrow. As for the meantime, Advanced Placement Art History is demanding my attention for Monday’s classes. Reactivated, I’d go home to the eternally rewarding game of scribbling. Thought was never an isolated thing with me; it was a game of tests and balances, to be proven by the written word. My heart beats faster when I read anything by William Carlos Williams, physician, poet, perpetual scribbler. I spent my last day of this week of inservice, in my school classroom, getting materials prepared, the room arranged, and always scribbling my thoughts. 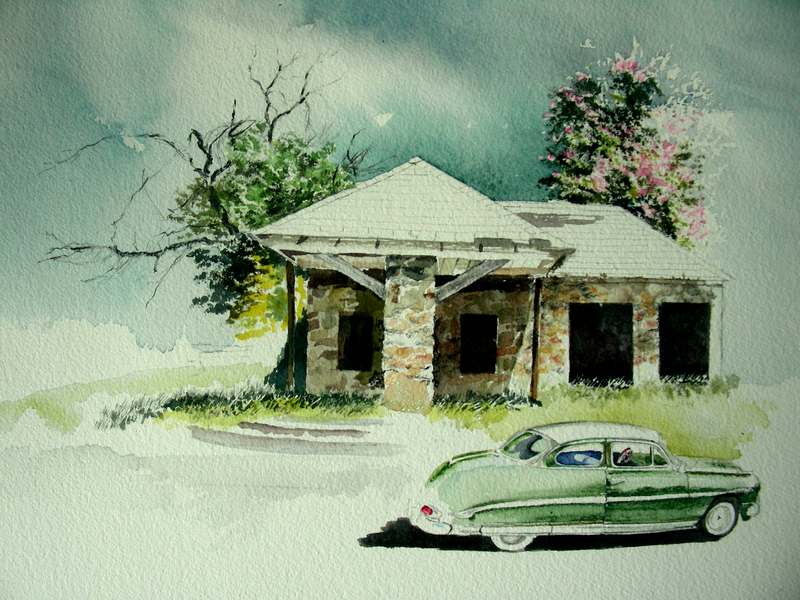 I found it difficult to work on this large watercolor as the evening light faded, for all the stopping and scribbling. Now, the light is gone, and there is nothing left but to scribble. I haven’t felt the compulsion to shift my blog into a “scribbling” blog (though it sounds like one tonight). Tomorrow I’ll approach the watercolor with a fresh pair of eyes and see what it needs next. I will certainly keep flinging it up on the blog, daily now, I hope. Thanks always for being there to read me. I scribble when I feel that I am alone. I blog to remind myself I’m really not alone. Here, on the pulse of this fine day . . . I did not find it arduous to rise this morning before daylight, shower, and enter the studio. 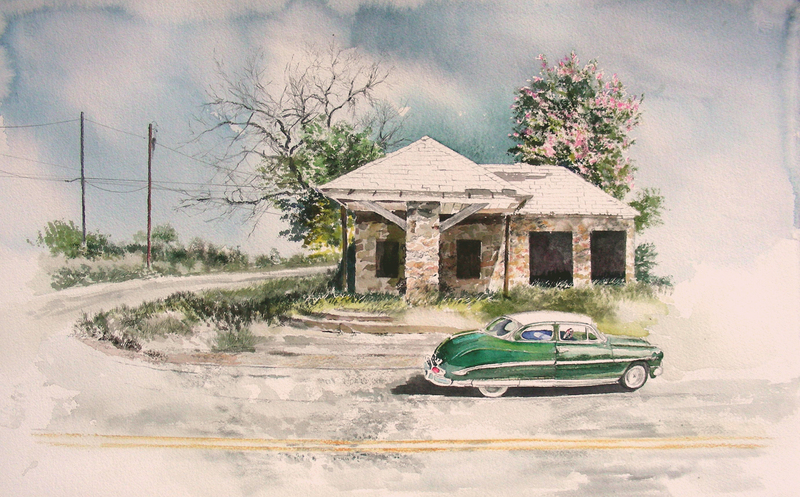 The prospect of bending over this watercolor before driving off to school was an inviting one, and I found the morning silence velvety and sweet. I could still hear those words of Maya Angelou that arrested me on that historic morning over twenty years ago, and was grateful for the memory. Her poem is part of the mantra that aids me in “believing” when I begin each new school year. 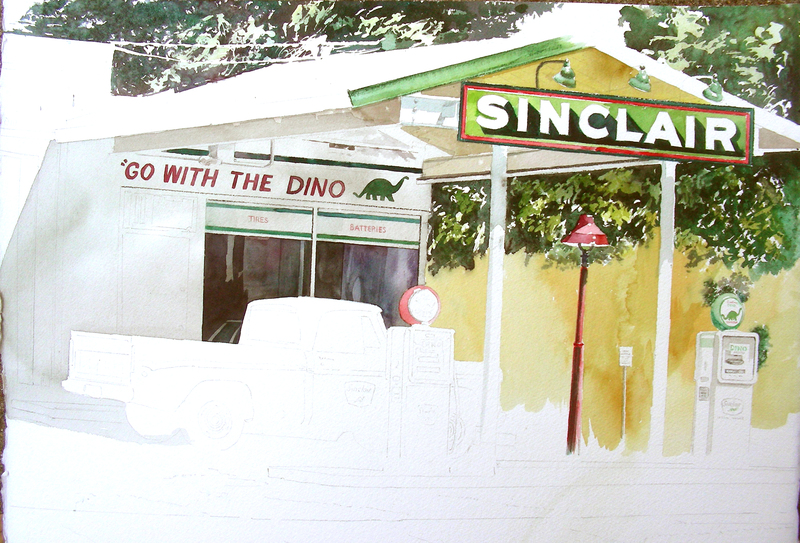 I’m beginning this watercolor on the light side, laying down colors that I hope will reflect that scalding hot day in Fort Worth when I took the photo of the Sinclair station. Later, I’ll try to put in the dark cool shades of the trees and building, hoping to build a good, vibrant contrast. 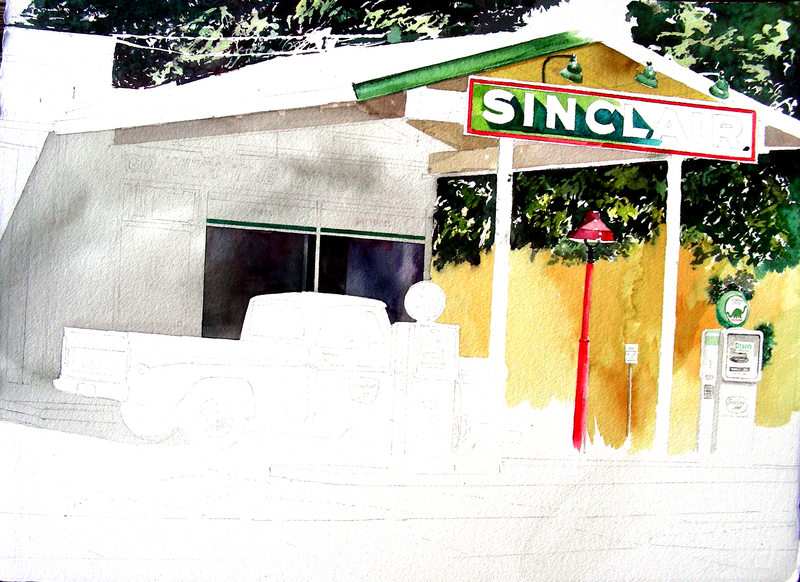 The only thing I had time to do this morning was work on the gas pump details, block in the hot, sunny background, and begin the red lamp post. Suddenly it was time to head for the campus. Today is the last day to get my classroom ready for Monday’s arrival of students. I’m glad to be “out in front” of my class content, so I can spend the next few days getting my heart ready for this next chapter. I’ve tried lately to spend more time in the evenings reading, reflecting, scribbling in my journal, and of course working on the watercolors that are still scattered, unfinished, across my studio. The balancing act begins next week, and I’m determined this year not to fail in my full-time job as an educator, nor to neglect my painting. Hopefully, the two areas will feed off of each other as they have in good days of time past. We’re in such a hurry most of the time we never get much chance to talk. The result is a kind of endless day-to-day shallowness, a monotony that leaves a person wondering years later where all the time went and sorry that it’s all gone. . . . The Chautauquas were pushed aside by faster-paced radio, movies and TV, and it seems to me the change was not entirely an improvement. Perhaps because of these changes the stream of national consciousness moves faster now, and is broader, but it seems to run less deep. The old channels cannot contain it and in its search for new ones there seems to be growing havoc and destruction along its banks. In this Chautauqua I would like not to cut any new channels of consciousness but simply dig deeper into old ones that have become silted in with the debris of thoughts grown stale and platitudes too often repeated. “What’s new?” is an interesting and broadening eternal question, but one which, if pursued exclusively, results only in an endlesss parade of trivia and fashion, the silt of tomorrow. I would like, instead, to be concerned with the question “What is best?,” a question which cuts deeply rather than broadly, a question whose answers tend to move the silt downstream. . . . Now the stream of our common consciousness seems to be obliterating its own banks, losing its central direction and purpose, flooding the lowlands, disconnecting and isolating the highlands and to no particular purpose other than the wasteful fulfillment of its own internal momentum. Some channel deepening seems called for. A heartfelt thanks I extend to those of you who “missed” me, and inquired about my welfare during this recent blog silence. At the peak of the Texas summer inferno, my air conditioner drain got clogged, and the condensation backed up, soaking my carpet in two rooms in the back of my home. I had to wait in line (a week) for an available plumber under my home maintenance policy. So . . . 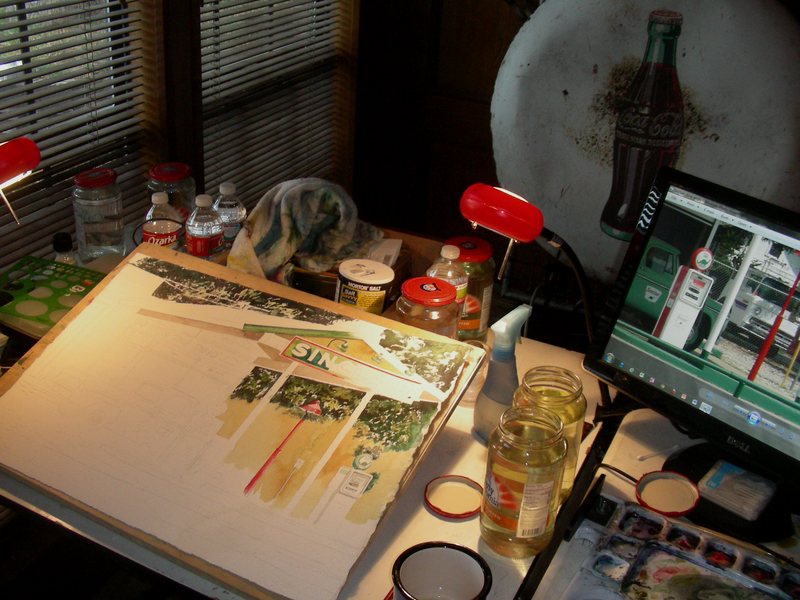 I had to close the blinds to my studio windows to keep out the sun, and refused to watercolor under artificial light. A week of mandatory back-to-school meetings also kicked in, so my time has been taken every day this past week. Now, the plumbing problem is fixed, the A/C is running cold and dry, my blinds have been re-opened, and I returned to painting yesterday afternoon, early this morning, and late this afternoon. Anyone following my blog entries knows I have come across a restored Sinclair gas station on McCart Ave. in neighboring Fort Worth. 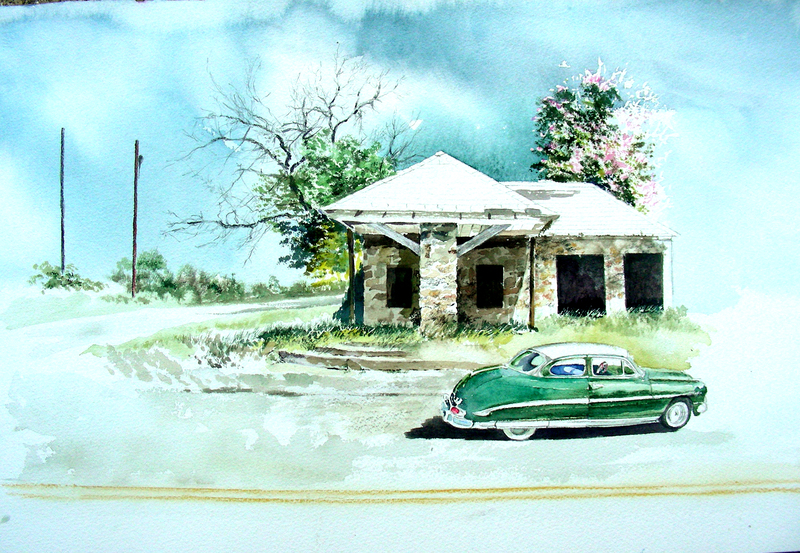 I began this full-size watercolor, but only had it drawn out when the plumbing problem began, and the school meetings called me back into service. I’m painting faster now, not because of any deadline, but because I have been frustrated, laying the brush down for a week. I feel that I am recovering a rhythm lost a week ago. And I am enjoying this renewed vigor in painting, immensely. As to the quote I posted above from Robert Pirsig, there is much linguistic poison I could spew on this blog page, but I choose not to do that. I was forced to sit for hours this week and listen to “experts” tell us why our public schools are not up to standards. I have never been convinced by statistics and interpretations spun by those who spend no time in the classroom, yet every year, I am forced to sit for hours and listen to them pontificate. This year was no different. At the foundation of my educational philosophy is the conviction that there is no royal road to education, no shortcuts, no such thing as faster, smarter, more efficient. Technology will not educate our students faster. We learn by acquiring details, and then composting, reformulating, pushing it back out in writing and oral discourse, debating and re-evaluating it, revising, and pushing it out again. All of that requires time. There is no short cut. Thinkers are grown over the years, not in six-week grading units. I myself am still growing my intellect, refining my discernment, practicing and criticizing my own writing and discourse. My pledge this year, as always, is to take the students where they are, and do my very best to push them further down the road, engaging in that arduou process, so that they leave my class smarter and more polished than they were when they arrived. The numerical values used to quantify the excellence of my students’ achievement I will take with a grain of salt. They are not statistics, they are real people, with real life issues, and an inborn drive to grow. I will not stand in their way. My greatest rewards during the swirling maelstrom of meeings this past week were those stolen moments of genuine conversation with enlightened colleagues, over books, ideas, and genuine wishes to continue what we started at the beginning of our careers. These moments we were able to have in spite of the regimentation of the week’s mandated meetings. These moments we had because we wanted to discuss issues that matter in education–real issues involving real classes, real students, and face-to-face daily encounters. School doesn’t begin till Monday, but I’m ready. And I have pledged to myself that I will not stop painting with the commencement of the new school year. 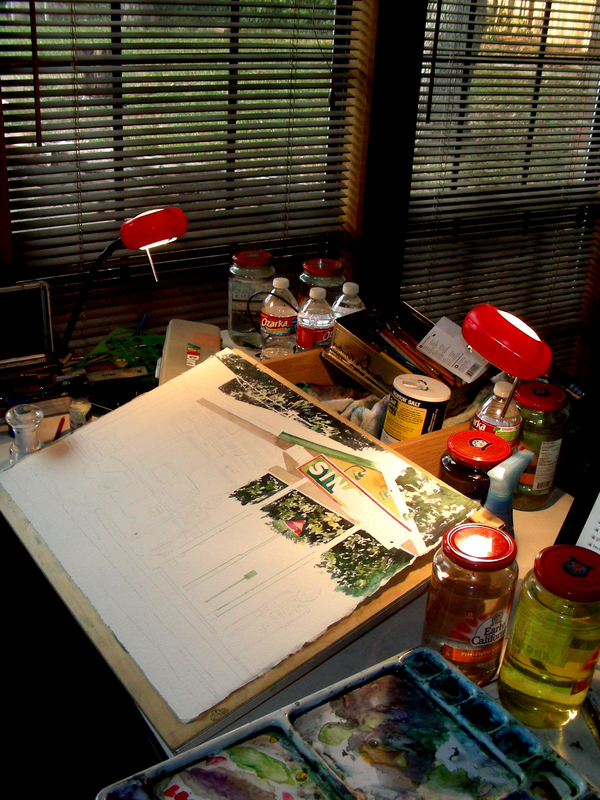 I have an early-morning appointment with my drafting table. The supplies are laid out and ready. I’ll see what I can do on this painting before I head back to my classroom to spend another workday. The sketch hunter has delightful days of drifting about among people, in and out of the city, going anywhere, everywhere, stopping as long as he likes–no need to reach any point, moving in any direction following the call of interests. He moves through life as he finds it, not passing negligently the things he loves, but stopping to know them, and to note them down in the shorthand of his sketchbook, a box of oils with a few small panels, the fit of his pocket, or on the drawing pad. Like any hunter he hits or misses. He is looking for what he loves, he tries to capture it. It’s found anywhere, everywhere. Those who are not hunters do not see these things. The hunter is learning to see and to understand–to enjoy. I cannot claim the role of hunter today–I was directed to this restored Sinclair station at 3725 McCart Avenue in Fort Worth. It has been posted on Facebook. I made two trips there today (morning and afternoon), and was delighted to encounter another photographer who also had seen the image on Facebook. 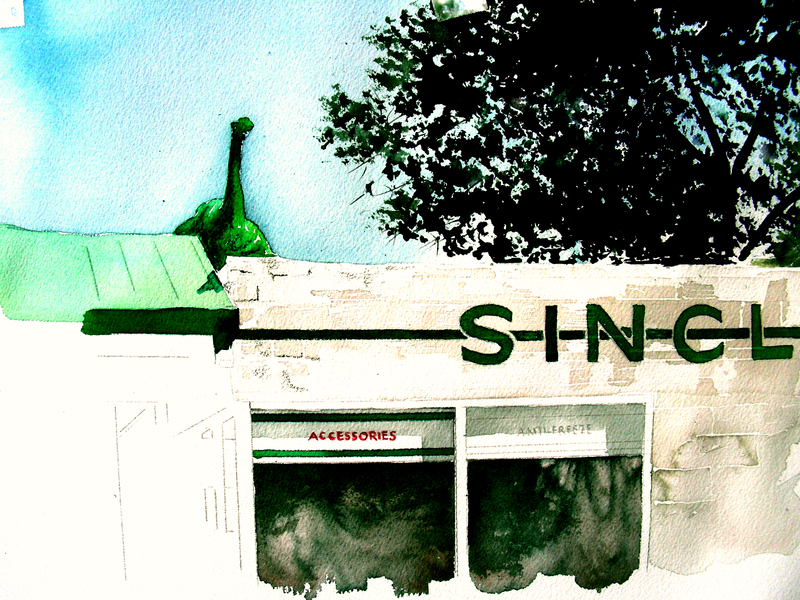 This is just a quick 8 x 10″ preliminary watercolor sketch of the side of the business as it appeared to me this morning. I have a real urge to work larger and in more detail on a frontal composition of this beautiful restoration. The owner has taken real pride in resurrecting this site, and I cannot wait to paint it with as much authenticity as I can muster. Every brush stroke diminishes the importance of the preceding one. The day has been a relaxing one for watercoloring. I’m moving slowly on this one, trying to make every brush stroke count. I’m being careful with the Hudson, not sure exactly how to solve all its problems, particularly its color. So far, I’m happy with it, though. 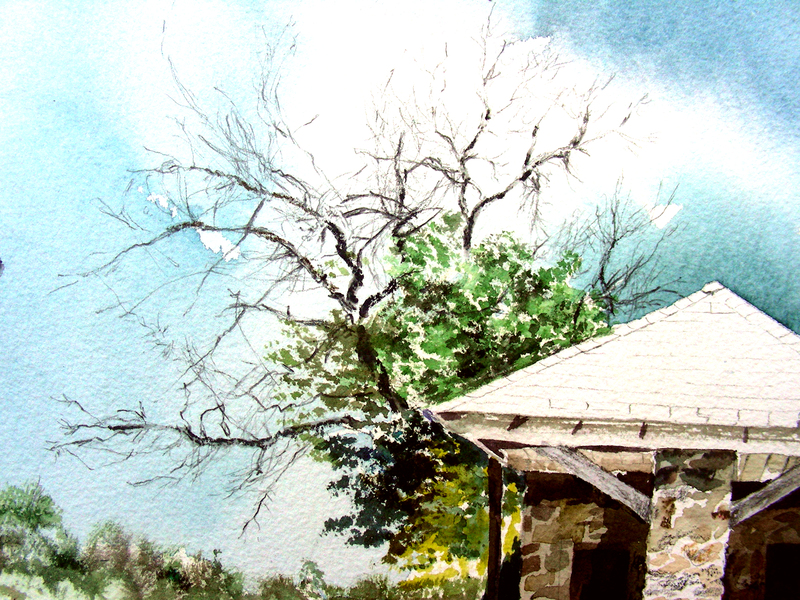 I’m also taking my time with the shadows on the stone building,layering them slowly, working carefully between warm and cool washes. I still have decisions to make concerning the background and foreground. The longer I linger over this, the more I’m enjoying it.